Over the past two weeks, I have been mourning the loss of a very close colleague. A friend. An inspiration. He was a visible and visceral leader of our company. We learned of Dan Sottile’s passing more than a week ago when he didn’t appear at a client meeting. He died that morning at the age of 50. It left our entire organization in a state of disbelief and shock. Dan had a single digit employee number and was the reason many people decided to join the company. Since his passing our energy as a company has gone into comforting his family and assisting with arrangements, but also into our overall work family as it comes to grips with this loss. Overall, what we did was recognize that we had lost a great leader. Those of you who follow my blog regularly know that it is focused on leadership. I’ve tried to look at Dan through that lens and describe him as a leader, to use our known models of leadership to describe him. Was Dan a “follow me” type of leader, where people would follow him on any quest. Perhaps there is some of this in Dan, but what doesn’t ring true is that Dan was not the kind of guy who wanted to be out in front. He wanted his people to shine. Did Dan lead by objectives? Well … no. Dan always had objectives, but he wasn’t driven by them. In fact Dan’s objectives were always so much bigger than anyone else’s they would probably scare people away if they were asked to deliver on them. How about command and control? Not a chance!! Dan didn’t’ issue commands, and it was not in his nature to be controlling. I’ve written previously about the topic of Evocative Leadership, which is about transformation rather than transition. It is about evoking the skills and capabilities of others through powerful questioning and envisioning techniques. There’s certainly some of that in Dan, but it isn’t his primary style either. The opposite of evocative is provocative leadership, characterized as a leader focused on “my ideas, my insights, my solutions”. Dan certainly had lots of ideas, insights and solutions but to say he focused on them and led through them wouldn’t be right either. Dan didn’t force anything on anybody. In short, Dan isn’t any of these types of leaders. He does some of these things, avoids others but in the end he adds a secret ingredient that only he has … HIS HEART!!! He always put relationships and community first and knew that in doing so, something great would happen. His heart was huge, as was the passion that lived within it. The stories told over the last week are about how Dan refused to think small. When someone dared to think that they could triple their business unit to $10mm, Dan would say “we aren’t stopping until it is $100mm” and then would proceed to convince the other person in the conversation how it was possible. He dreamed big dreams. His charisma drew people to his dreams, and they began to believe as well. His energy for people and sales were infectious. People work at our company because they believe we can’t fail, we are unstoppable, because Dan convinced them it is true. One of his true gifts in life is to attract great people to him, and to inspire them to think bigger than they ever have before. Anything is possible! Just dream it and then go make it happen!. And if it doesn’t happen this time be resilient. Bounce back with even more energy. Think of the way a willow branch springs back to where it was before it was bent! Probably the greatest compliment to any leader … Dan Sottile grew leaders at home. All three of his sons were icons of leadership throughout the celebration of Dan’s life. The grace and compassion with which they conducted themselves is no accident. So it makes me think. What if all leaders showed up every day leading with their heart? What if we stopped examining the limitations we work within and imagined the possible? What if we went beyond imagining, and believed it was real? What if we broadcast that infectious positivity to everyone around us? What if we challenged our teammates to reach down for that one more level of excellence and creativity that would make our efforts truly revolutionary and unique? I think I could do more of that, but I know I want to work with leaders that engage in this way. Leaders such as Dan Sottile. Thank you Dan for showing us another way. We now need to make your dreams come true! Ian, I am so sorry for your loss and your company’s loss in losing a friend and colleague. The way you describe Dan makes me wish I had know him because he seems to have been the type of leader who empowers others to leadership – and this is my favourite quality in a leader! My thoughts and prayers are with you and all who knew Dan. Thank you Diana. Great observations. What a great tribute to Dan very well written Ian. I wish I had the pleasure of knowing Dan better your description of him as a positive person and true leader was inspirational. You ask “what if” we challenge our teammates and also broadcast ourselves in a more positive way, I believe that by doing that our life will be healthier and much more productive. Positive attitudes are infectious and that’s an infection that can heal all! Takes a heart to know a heart…Blessings to your great heart Ian Munro! Thank you for this contribution Heather. It is something I think we all need to remind ourselves of, this ability to live and lead from the heart. Sorry for the loss. He’ll he a huge heart to fill by the sounds of things. You do have a great Heart to Ian. Thanks for the support Karen! Ian, I am feeling for you and all the people whose lifes were touched by Dan. Your big hearted and warming tribute to him is proof that his legacy will live on forever and the way you describe him, I can’t help thinking, is probably exactly the way he would have liked to be remembered. Thank you for sharing such an inspiring example of humanity and leadership. Thank you Rene. As always I appreciate your support, and in this case recognition of a special person in Dan Sottile. This has been a great tribute to your friend and colleague. Sorry to hear of the loss of your colleague Ian. I only met Dan a few times, but I understood him to be a good man and very talented. Much too young to leave. Thanks for your support, Greg. Ian – all of your posts on this blog have been fantastic but this one is extra special. 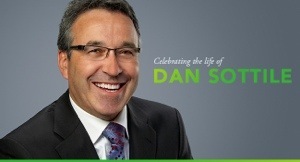 I did not know him that well, but it was easy to see how Dan’s energy, charisma and leadership were somethign special. Thoughts and prayers continue to be with the Sottile and the LVS families during this difficult time. Thanks for the comments and the support Alex. I send you and everyone who have lost such a great man, husband, father, friend, co-worker prayers and light. It does take a great heart to know a true heart Ian — your words are beautiful and heartfelt. 1. Build a Canadian company that will last 75 years. 2. Build an organization that allows people to develop personally and in their careers. 3. Give back to the community and participate. Topics like earnings, results, profitability were a long way down on his list of things to talk about. When I think of Dan, I simply say that the way he thought about business was different. Big goals? For Sure! Leading with heart? No Doubt! A truly great guy that will be missed by all those that had the opportunity to spend time with him. Thanks for adding your voice Bill! It’s taken me some time to be able to speak of Dan’s passing. First off, Dan hired me as an Account Manager many years ago. From the moment I met Dan I knew I wanted to be apart of LVS and make his dreams come true. He was a Great Visionary and had one of the Biggest Hearts I have ever known. Anyone that had the honor to work for Dan will understand! Dan may be gone but he lives with us each and everyday…Pushing us to think Big and to make Our dreams come true! Thank you Dan for everything you have done for me and my LVS family! Thanks for the heartfelt contribution Bob. I hope you are doing well.